If your SalX download doesn't begin shortly, click here. No credit card required. Cancel anytime. | © pfm Studios Inc.
⦿ Many current systems today have been a great success. That is, until technology moved past them. The SalX team has researched what has worked and what has fallen short. This shortfall includes how business owners expect to run their business today and how clients expect communication to be. So what does that mean? ⦿ The SalX team have created a platform that addresses the need to be forward thinking while allowing emerging trends and methods to be easily incorporated into SalX. If there becomes a new method of communication that trends to most clientele we are prepared to bring that into the SalX platform. All at no extra cost to you, the business owner. ⦿ Features such as SMS and online booking usually come at an extra cost. With SalX, it is all inclusive. No shortfalls or caps are imposed. Use SalX the way it is intended - to be a full service business tool. ⦿ We understand that business tools albeit come at a cost, should present a return on its investment (ROI). Typically we see an ROI immediately. With a single full service client a month, your investment in SalX is paid for. ⦿ Once the ROI is realized, you as a business owner will see immediate increases in revenue month over month by way of a reduced need to maintain the business 'paperwork'. Allowing you to get back to your craft versus spending so much time on the business end. 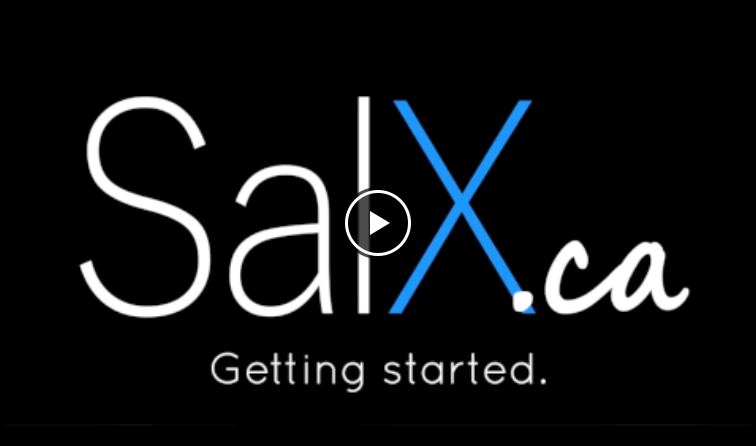 Let SalX help you work smarter, not harder. ⦿ Have you been using your current system for some time and are concerned about migrating existing data? Download SalX and contact the team today to find out how we can help with that too! ⦿ Whether you're the owner of an established body art studio or just starting out, you've undoubtedly considered - "What should I use for business software? Does it even exist for my business? Everything I research comes up salon/spa software?!" ⦿ Square peg into a pinhole. That's what our team continues to hear from the Tattoo and Body Art community have endured until now when discussing their current business software. The SalX team has worked along side great clients to determine what the business owner and staff in the Tattoo/Body Piercing business need. ⦿ We have been the first in the game to incorporate client account deposits and balances. No more 'work arounds'. Lets get down to brass tax and allow you to do it right the first time. ⦿ The SalX team has also incorporated multi level catagories for products allowing your inventory of piercings to be catalogued properly. This methodology allows for tighter control on stock and a more true realization of profits month over month. ⦿ We continue to work with our great clients in this vertical and look forward to speaking to you on what more SalX can develop to enhance its value in your Tattoo/Piercing business. ⦿ As an established or newly graduated RMT, life includes maintaining certifications and client relationships. ⦿ One element that often is overlooked but equally important is how best to maintain client communication effectively. This ultimately comes down to engaging a powerful, effective and user friendly appointment booking system. ⦿ Ideally, your business will ramp up to having too many appointments each day to commit to memory, your phone or a black book. SalX integrates realtime 2-way SMS and email notifications within the application so to communicate with each of your clients. ⦿ SalX includes built in client cards where a client may fill in your custom health and lifestyle questions for you to be able to have the information you need to provide the best service required. Always on file, attached to the client profile and can be updated when required. ⦿ Some of the pillars of running a successful yoga studio include being authentic and diverse. Wholistic elements aside, many successful studios establish what their break even point month to month will be. ⦿ Once this number is determined you and your yogis likely determined what this number translates into as potential daily classes, private sessions, workshops and other events. ⦿ SalX allows you to achieve this number with a smart approach using predictive reporting of each class, session and workshop schedule. The SalX wait list allows you to keep track of clients waiting to join in. As a client may need to cancel, a wait list client can be assigned and notified into that class. Thus maintaining and increasing studio revenue! ⦿ Expense tracking and reporting on all elements of the business from in studio cleaning products can be quickly reported on. Selling products? No problem! SalX is a full point of sale system too, which allows you to keep track of revenue and expenses on your product lines. Again, all reportable by the day, week, month or any date range. All exportable - ready for your accountant. ⦿ You have a great location, rock solid business plan, purchased inventory, and even opted for that awesome hydraulic grooming table. Everything set right? Take a moment to think about an important tool of your trade. Your business software. ⦿ SalX provides the proven elements to make any grooming business function seamlessly. From your online booking presence from your social media or website to your method of communication with clients over 2-way SMS and/or email. ⦿ And when Bella the Shih Tzu is looking fabulous, the system can communicate directly with her owner to let them know she’s ready for pick up! Easy! ⦿ Having the tools of the trade allows for your best approach to success. Why think of software any different? ⦿ You’ve dedicated your life to health and fitness and live by the proverb "Train, Say Your Prayers, Take Your Vitamins." – Hulk Hogan?! (too much… k… let’s move on). ⦿	Passed all your fitness tests, exams and certified to train clients. You may even have a good hand in your website, social media, and marketing strategy. ⦿ Success comes from your passion and knowledge. Be sure to complete the circle of success to your business by looking into the right software for you! ⦿ SalX allows you to hold private sessions and/or classes. The SalX wait list allows you to keep track of clients waiting to join in. As a client may need to cancel, a wait list client can be assigned and notified into that session. ⦿ Beauty and Esthetics program enrollments are steady and very popular as a selected profession and craft. The element of business sense is an important part of that curriculum. ⦿	How best to introduce this business sense? 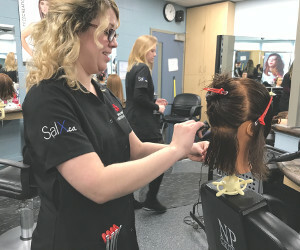 Introduce the software directly into the program so students will learn and get comfortable to the workflow and process required to maintain a salon/spa. ⦿	Academic packages are available so instructors may allow every student to become familiar with the SalX interface. The active SalX user guide accessible on each window offers a searchable index of ‘how to’s and workflow ideas allowing each student to learn what a business package should do for them. ⦿	Demos for program coordinators/professors and your campus IT departments are available on request. ⦿	Have we not addressed your business directly? That doesn’t mean SalX isn’t the answer for you. 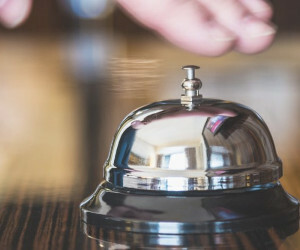 ⦿	Any timed service business where you provide services and products could benefit from SalX today. • …ready to put your business here? Download and start using SalX today. Contact us with any questions or comments! Step 1. In the bottom of the screen you will see the download bar. Click on the Run button. Step 3. SalX will proceed to install. Step 4. Once SalX has been installed proceed to enter your SalX account credentials. ....But I am running a Mac?! COOL! We have many happy clients running SalX on their Mac. There are a few steps that need to happen prior to starting SalX. These include... (btw if you'd rather watch a video on this simple process click here). Step 1. - install VirtualBox: VirtualBox runs on Macs sand allows you to install Windows 10. Get it from here, download the 'OS X hosts' package, and install it. No special instructions needed. Step 2. - Get the Windows 10 ISO File: Head to this page to get it. When you go there, click "Get started," and follow the instructions and prompts until you finally get to the download page. Choose your language and whether you want to download the 32-bit or 64-bit version. Depending on your hardware we recommend downloading the 64-bit version. Remember where you have downloaded the ISO file, because you'll need to know that later. Step 3. - Start the Windows 10 installation Run VirtualBox and click the New icon on the upper-left side of the machine. From the screen that appears, type Windows 10 in the name field. Then from the Version drop-down box, select Windows 10, and choose either the 32-bit or 64-bit version, depending on the ISO you downloaded. Step 4. - Select the amount of RAM Next you'll be prompted to select how much RAM you want to devote to your Windows 10 virtual machine. You'll be shown a recommended amount of RAM. You can change it if you want, but I've used VirtualBox for several years and have created many virtual machines, and I've found its recommendations to be on target. So unless you know what you're doing and have a very good reason to change it, accept the recommendation. Step 5. - Create a Virtual Hard Drive In order to install Windows 10, you'll have to create a virtual hard drive for installing it. So from the screen that appears after you've selected the amount of RAM, click "Create a virtual hard drive." Choose VDI (VirtualBox Disk Image) as the file type. For the type of drive, you'll have a choice between one that is a fixed size and one that dynamically allocates space, that is, it grows larger if the operating system needs it. Your best bet is to choose a fixed size. That offers better performance. Click "Create" after you've made your choices. Step 6. - Select your ISO as the startup disk After you create the virtual hard drive, you'll be sent back to the VirtualBox main screen. Click the Start button. You'll be asked to "Select start-up disk." Head to where you downloaded the Windows 10 ISO file, click "Start," and the installation begins. Step 7. - Finish installing Windows 10 From here on in, it's just like any normal Windows installation, with the usual occasional reboots. The reboots happen inside VirtualBox, not on your machine itself. Step 8. 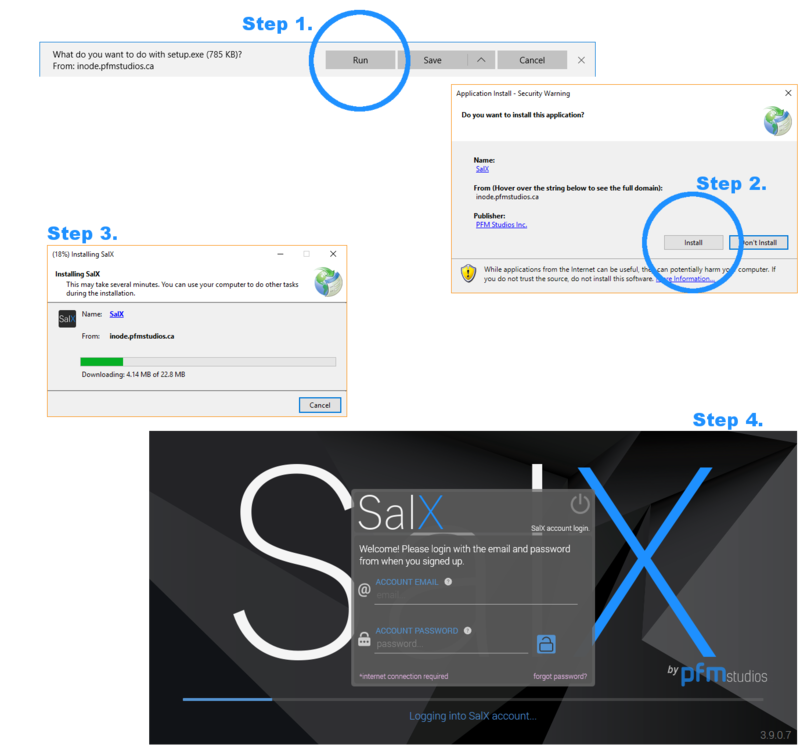 - Download, install SalX Start Windows 10, download SalX and follow the directions! Need us to walk you through it? Have a member of our support team remote into your computer. We're please to provide a remote access service to users current and future! 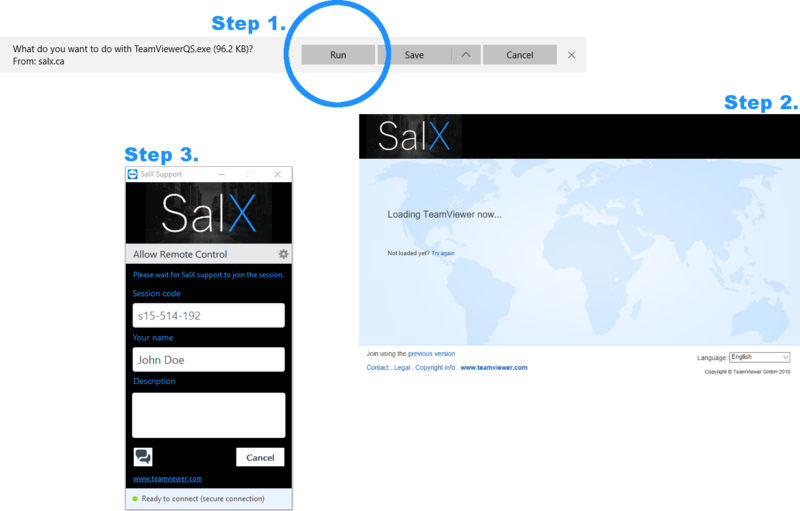 Simply install the SalX TeamViewerTM GmbH Quick Support application on your local machine and it will dispatch a request to a member of the SalX support team. Whether you require help with the SalX installation or configuration - we're here to help! If your SalX Quick Support download doesn't begin shortly, click here. Step 2. Click Install. Once the URL has been run, click the .exe at the bottom of the page. You will be asked "Do you allow the application to make changes to the computer"? Select "Yes"
Step 3. Once the SalX Quick Support module has been installed a member of the SalX team will be dispatched to connect to your machine remotely.